New Hammers head honcho David Sullivan has wasted no time in mapping out his plans for the club: he wants Champions League action within seven years, and a move from the Boleyn ground to the Olympic stadium, just two miles away, after the 2012 Games are over. Tottenham, Leyton Orient, and the Hammers have all been linked with the cupcake, but shied away in the past because of the need, as detailed in London's winning bid, to retain the athletics track. The design of the stadium, which has most facilities and amenities located on the outside and lacks any corporate boxes, would also be an ill fit for a football ground. Sullivan's vision, though, is for a "peoples' club", with the 80,000 capacity maintained, allowing West Ham to offer tiered ticket prices to attract more fans; pensioners might be able to get in for as little as £3, kids for a quid. 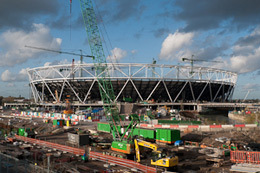 The stadium's post-Olympian purpose has become a major headache for the Olympic Park Legacy Company, and they may be more agreeable to concede some of the demands West Ham would make if they moved in. Shadow sports minister Hugh Robinson said that any "legacy solution" would need to be "commercially viable and that probably means a Premier League football club alongside its athletics use", indicating that a Tory government would be happy for the move to proceed. The increased capacity, and perhaps the sale of Upton Park, would polish off some of the huge debts the club has run up in three years of inept mismanagement. That, and the proximity of the stadium to the Irons' roots, might convince supporters it's a good idea; east Londoners who don't fancy seeing their new park being turned into an arena for running battles between West Ham fans and their neighbours, might not be so keen.